MOSCOW, Oct. 22 (UPI) — Growth of the Russian economy halted in September, data from its economy ministry indicated Wednesday. The economy grew by only 0.8 percent in the first nine months of 2014, Economy Minister Alexei Ulyukayev reported, suggesting there was no growth in Russia’s gross domestic product starting in September. 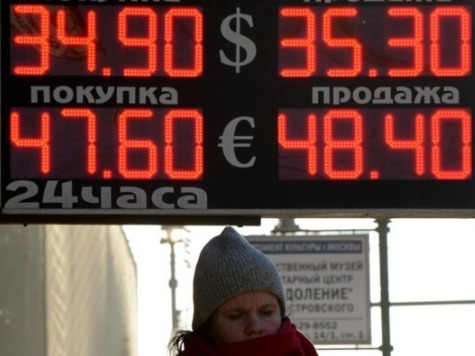 It is likely that Russia’s growth in 2014 will be its lowest since 2009. The causes include economic sanctions by Western countries in response to Russia’s involvement in Crimea and Ukraine, and the resulting effects of Russian sanctions; flight of capital and lack of investment stemming from uncertainty; the decline in the cost of Russia’s most prominent export, oil, and the fall in the value of the ruble in 2014. Monday Russia’s sovereign credit rating was downgraded by Moody’s Investors Service to only two levels above junk bond status. Standard & Poor’s rates Russia’s debt at one place above junk status, and any further decline would make future Russian debt more expensive and any investment in the Russian economy more risky.